In a bit then 2014 ye fat knobhead. Won’t go down as one of the better years, that. Vandals, crisis, scandals, ISIS. The Germans were the best at everything. Everton really weren’t. But anyway, happy New Year to you all. I hope you’re happier when you leave 2015 than when you entered it. 2014 was a topsy-turvy year for Evertonians, as you well know. It began with the burgeoning sense of impending glory being ruthlessly pounded into the ground by Liverpool, and not long afterwards by Arsenal in the FA Cup. But at home no-one seemed a match for the well-oiled Everton machine. Once that form was translated into away games, we enjoyed seven consecutive wins. The chance came to make it nine with home games against Crystal Palace and Man Utd – United and David Moyes were toppled, but after the now-customary home collapse against Palace. The season ended poorly form-wise, but not points-wise. A full 72 points from 38 games – a record haul. 5th place being a disappointment to Blues – a disappointment, mind – showed the extent of our ambition under an exciting young manager and a talented team. We’ve been searching for that team ever since. In a season in which we had European football to deal with for the first time in five years, the only additions to last season’s squad were Samuel Eto’o and Muhamed Besic. Romelu Lukaku and Gareth Barry made their loans permanent while Christian Atsu replaced Gerard Deulofeu. Still, 2014 was the year Samuel Eto’o – the revered Eto’o – signed for Everton. The ambition was still there. Why else would Eto’o have joined a club that could not offer him anything like the wages other suitors could have? The development of youth has been pleasing – Luke Garbutt, Tyias Browning and Ryan Ledson led the line of young talent to make their full senior debuts. The future, it seems, is bright. And it better be, because the present isn’t treating us well. I’m not going to spend this preview delving deep into the problems we have at the moment, because there are many and I’ve left this much too late. Soz. But it’s important to note now that those who were hailing Martinez as a tactical master when things were going well cannot turn around and say he’s inept when things are going badly. Neither can you excuse him for his errors. Both players and manager have been responsible for both the form that saw us winning seven in a row and three defeats on the spin. That means either can be replicated at any time. It’s being billed as a meeting between crisis clubs by the press, which is a bit depressing. Hull City have won just one of their previous 12 games, won just seven league matches in the entirety of 2014, and have struggled in front of goal despite recruiting the likes of Abel Hernandez, Gaston Ramirez and *snickers* Nikica Jelavic. Jelavic has been the most proficient of the lot. Only goal difference kept them from starting the year in the relegation zone. That means one thing – that they’ll be desperate to get three points. We’re not scrapping for our lives, merely fighting to stop us sinking. They’re going under. The Hull line up is as follows: McGregor, Bruce, Chester, Davies, Robertson, Elmohamady, Livermore, Meyler, Ramirez, Hernandez, Jelavic. Suitably sh*te substitutes Aluko and Sagbo are both ready to come on and score the winner, while Tom Ince is due one good game a year. Why not start 2015 on a high and go downhill from there? Great logic. McGregor’s an excellent goalkeeper, so we’ll need to test him. The biggest problem with our style of play is it takes us too long to reach the opposition’s penalty area, and as a result we’re not having enough shots. 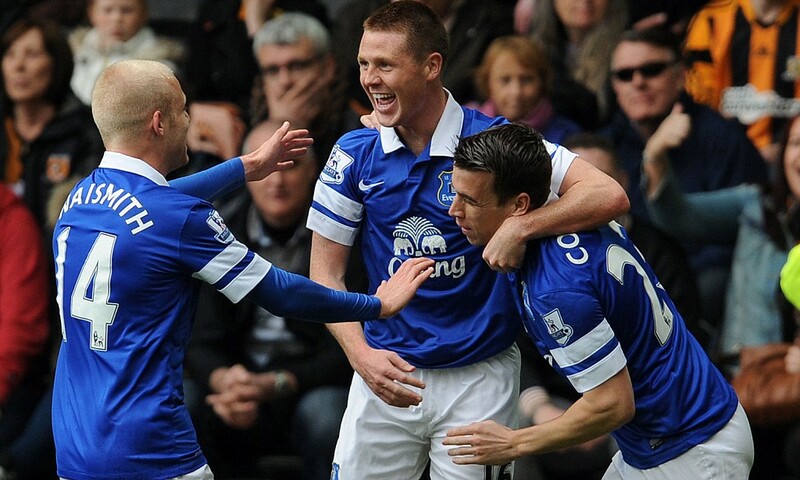 The Everton line-up: Robles, Coleman, Jagielka, Alcaraz, Baines, Barry, Besic, Barkley, Naismith, Mirallas, Kone. Arouna Kone was a bright spark in the Newcastle defeat – he looked lively and deserved his first Everton goal. It was the end of a long and difficult time for him, and now he’ll be raring to end our comparatively short time in the doldrums. Robles will have been having nightmares about Gaston Ramirez fliers for a while so he better have been working on catching. It’s a big relief to have Jagielka back in place of Distin. Short preview, this. I’m sure you’re delighted. I’ll finish with some resolutions. Let’s take games by the scruff of the neck. Let’s learn when to keep the ball and when to be direct. Let’s create so many chances that it’ll be nigh-on impossible to miss them all. Let’s cut out the stupid individual errors that have cost us games. And one for the fans – don’t give up on your club. This is our Everton. The season’s far from over. If you believe, just as the manager and players believe, that we can turn this situation around, it can happen. Here’s to a successful 2015. Up the Blues.